If you are a proud Kingstonian anxious to showcase your city to friends, don’t hesitate to suggest a Kingston 1000 Islands Boat Cruise. A wide variety of lunch, dinner, sightseeing and charter tours is offered between now and October 31, but there is no time like the present! I recently experienced an idyllic three-hour luncheon cruise on the Island Star, one of the three unique 1000 Islands Cruise ships. The weather was perfect, the meal was delicious and the entertainment was outstanding. The theme was Mardi Gras, so guests got into the spirit by donning sparkly top-hats, glittery shades and colourful beads. When musician Spencer Evans and his trio weren’t belting out a mix of jazz, zydeco, Cajun and R&B that would do New Orleans proud, he was regaling us with interesting facts about the 1000 Islands area. What a tasty start to a Cajun culinary adventure! Prepared fresh on the boat, these entrees were memorable. 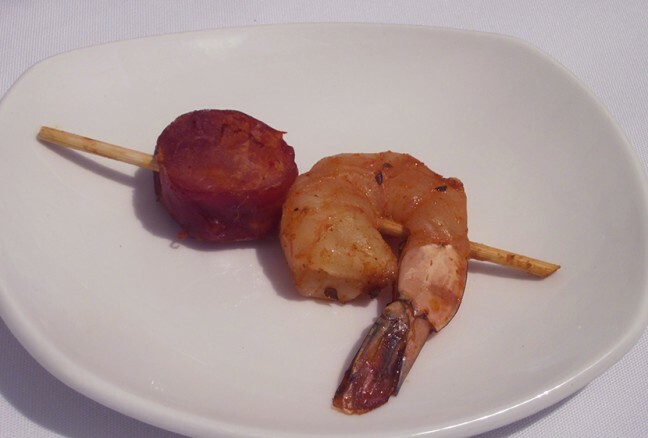 An amuse-bouche of skewered chorizo and shrimp set the culinary tone for the afternoon. From the four entrée choices on the Island Star lunch menu, I selected the chicken chasseur and was not disappointed. My companion raved about the fresh Atlantic salmon skewers and we both enjoyed the Caprese salad and delectable cake. Amazingly, all of this bounty is prepared fresh (no microwave, no heat lamp on board!) in a galley that would appear to measure less than a hundred square feet. 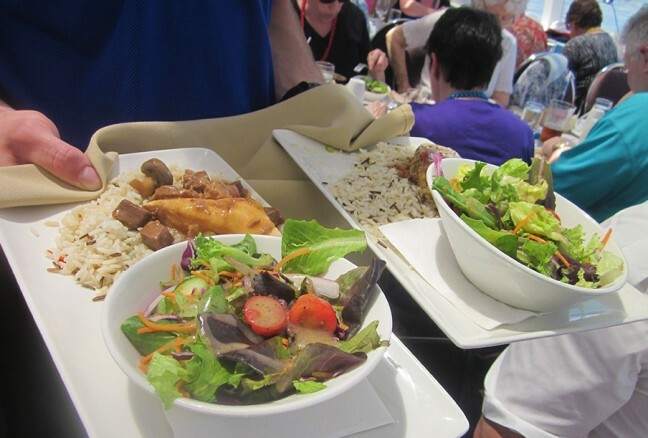 Dinner cruises on the Island Star offer a different, equally appealing menu. 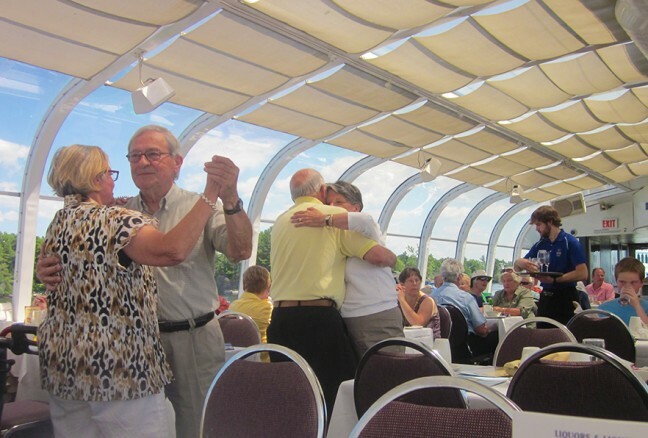 Lunches on Kingston 1000 Islands cruises are more casual affairs while the vest and bow ties sported by the serving staff at dinner raise the bar a notch. 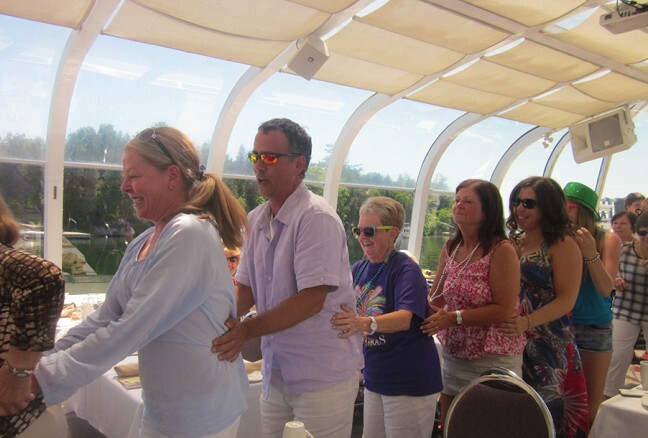 Between courses, guests initiated several impromptu Conga-line circuits of the dining area. Musician Spencer joined in; at other times, to the delight of the diners close by, he played his clarinet while standing on a chair. On this particular day, there was a lunch cruise on the Island Queen as well. This ship, a Mississippi paddle-wheeler, offers its own lunch and dinner buffet menu. At several points during the three-hour tour, the passengers on the decks of the Island Queen were visible to us on the Island Star. They were clearly having as good a time as we were. The third member of the Island fleet is the Island Belle, a replica St. Lawrence Steamer. The three vessels offer varying degrees of accessibility, with the Island Star being the most accessible. Captain Lee of the Island Star told me that the fleet is in the third year of a five-year plan to “green” the operation by introducing electric motors. Some of the music lent itself to a sedate two-step. The Mardi Gras cruise was a total delight. Although that ship has sailed, there are many more special themed events scheduled over the next four months, including several wine-tasting cruises, a beer-tasting cruise, a comedy cruise and a dozen music events ranging from gospel to big band to disco to blues to The Beatles and beyond. Can you imagine a more beautiful setting for Thanksgiving lunch or dinner, when the scenery along the St. Lawrence will be spectacular? 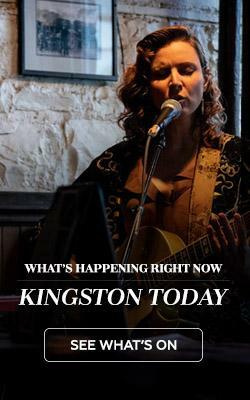 But don’t wait; today is a beautiful day and any day is a good day for you to be part of a Kingston 1000 Island Cruise. Revellers ranged in age from 9 to 92 and the energy was high on both ends of the spectrum.